Well, this is not an interesting post really. Just a Whoo-hoo! I finished something. And how I almost didn't. A while back, I was looking at retirement from the Army. I was suffering what I thought was a mild and temporary depressive episode. I had two books published, plus a bunch of short stories. I had just written a book titled Three Worlds Nations: Two Boys (or was it Barefaced?) and entered it in the ABNA. Got to the 2nd or 3rd round too. I don't remember now. I don't remember a whole lot anymore. Around that time is when my memory really started to go. I found food tasted like cardboard. The world was boring and pointless and grey. It felt as if there was no future, and not much past. I began to lose all motivation. I showed up late to work roughly four days a week. I appeared at PT formation one morning in hiking shoes. Another day I had a head full of bobby pins. These may seem little things to you. I promise you, they are not little in the Army. I guess I was "lucky". At the time, I was in a unit where much was tolerated and we were respected as older NCOs that had already proven ourselves. Nobody cared so long as the work got done. And anyway, I was a "short timer", looking at retirement, no point in spending too much time or energy discipling me when I wouldn't be there much longer anyway, right? I was getting therapy, once every two weeks. So I limped along to retirement. I planned to send that story off for publication at a traditional publisher. I even got some positive feedback and recommendation for some minor edits before acceptance. My dream was going to come true. See that period there? That one after what should have been a joyous exclamation? Yeah. That was the "depression". I couldn't be assed to do the rewrites. I couldn't motivate myself to send it back for review. I couldn't take the time to follow up on the inquiries. I hadn't written a short story in months. The longer stories languished in a few short notes on my computer. I went from writing two novel length books a year, even while working, to not even a few shorts no matter how much time I had to work on it. Retirement came and went. And then, one day, after months of no pay and doing nothing about it, I drove to Tucson with my son for a last visit with a VA doctor before I could start receiving a pension. And that's when this wonderful person noticed something odd. A quick blood test, a follow up x-ray, and I had a brand new diagnoses, hypothyroidism. And it had gone on a long time. Did you know hypothyroidism isn't just about getting fat? I didn't. I had no idea that sometimes the only symptoms are mental confusion, memory loss, and depression. 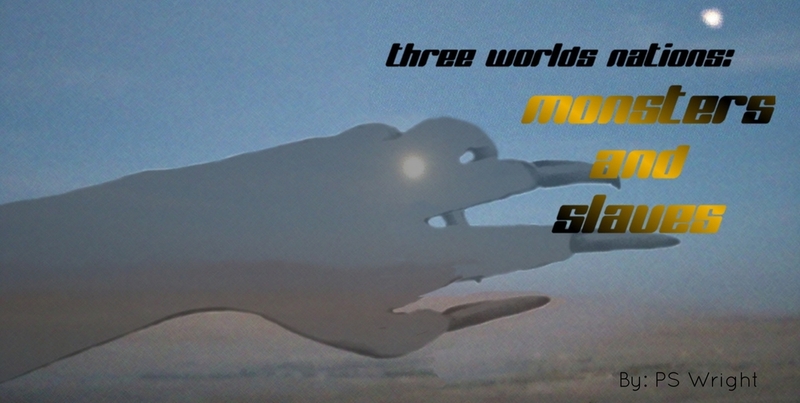 And please buy my book, Three Worlds Nations: Monsters and Slaves, available only on Amazon.com.